I’m going to list tlf here today, just because it’s Friday and because I’m feeling frisky. Having said that, I still haven’t got a clue what to do with tlf. 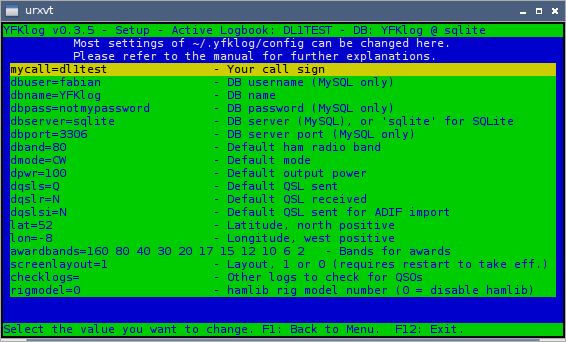 It’s very pretty though, and we all know how I get all wobbly-kneed when I see a text-based program that uses color. I haven’t been this lost since dxcc. But I suppose arbitrarily lopping off titles from The List would have left me without the experience of learning a lot of new things. So perhaps it’s for the better. And like the man said, knowing that we know what we know, and knowing that we don’t know what we don’t know, that is true knowledge. This entry was posted in Linux and tagged amateur, ham, practice, radio, test, training on 2015/01/23 by K.Mandla. I have a couple of other small Morse telegraphy tools in my list, and since we covered cwcp in the last post, it’s probably a good time to throw them into the mix. Here’s morsegen, from Luigi Auriemma. As you can see, morsegen is very straightforward, and really only reads text files and converts the contents into dash-or-dot sequences. No flags or frills, unless you consider the readout of Luigi’s fixed header to be a frill. In that sense, I would prefer morsegen work a little more like morse, and accept text either as a target, or through a pipe. morsegen seems hard-coded to look for a target file, and read through that. Which is all neither here nor there, and perhaps if you like, you can ask Luigi’s permission to adjust morsegen. I wonder if that wouldn’t make morsegen nearly identical to morse, though. Here’s something a little more ambitious, by the same author: morse2ascii. 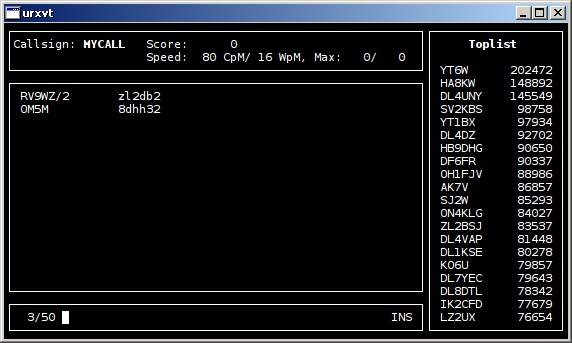 As far as I can tell, as someone unskilled in the art of decoding Morse telegraphy, morse2ascii is doing a good job. The file I borrowed was supposedly a training session, working through basic letters and digits before moving into specific sequences. It looks right, anyway. 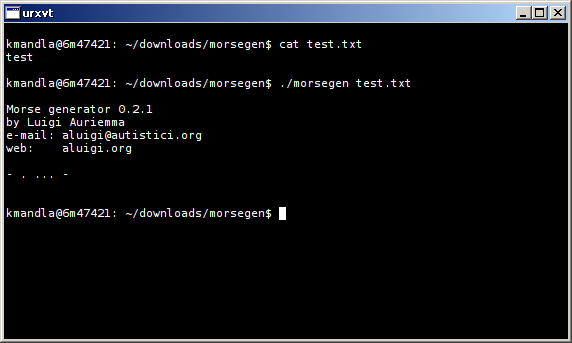 morse2ascii has the same arrangement as morsegen though, and won’t accept strings and wants a target file. So if you want to stream audio through morse2ascii, you might need to first capture the broadcast, then feed it to morse2ascii. I leave it to you to solve. This entry was posted in Linux and tagged audio, code, convert, ham, morse, radio on 2014/12/19 by K.Mandla. 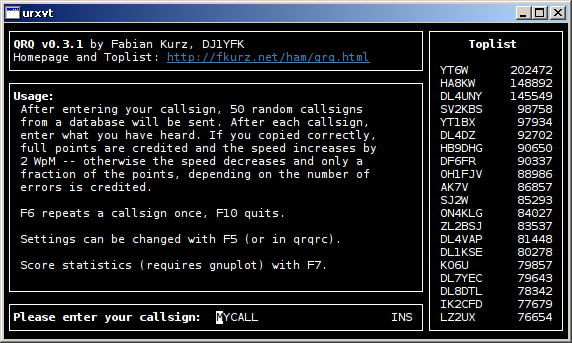 I found qrq a week or two ago, and while qrq is probably a very useful program for people who need to improve their skills with Morse telegraphy, it might be geared more towards those who have already mastered the basics. If you’re a newbie, cwcp might be more to your liking. Here’s the Linux Mint version. Much is the same between qrq and cwcp, but it’s also clear that their target audiences are different. cwcp has speed and volume controls, but also has controls for adjusting tone and other audio cues. qrq seemed to focus on recognizing call signs and building proficiency and speed, while cwcp starts with letter and number groups, and works up through English words and into other categories. cwcp also lets you type in your own text, and will replay it as tones. Like qrq, cwcp will need a little nudge with the alsa-oss package. I don’t see where that’s listed as a dependency in Debian, but I don’t know that oss is necessarily out of fashion, particularly among Debian fans. In any case, if you’re not hearing anything, that might be the reason. cwcp is part of the unixcw package, so it might be that you get more “modern” sounds support by bringing in the qt rendition. Try it and tell me. cwcp has color, as you can see, and I should note that cwcp seems comfortable arranging its layout to just about any terminal size, but only on startup. If you change dimensions after you begin your tutorial, cwcp might not notice it. This entry was posted in Linux and tagged code, ham, morse, practice, radio, test, training, tutor on 2014/12/19 by K.Mandla. 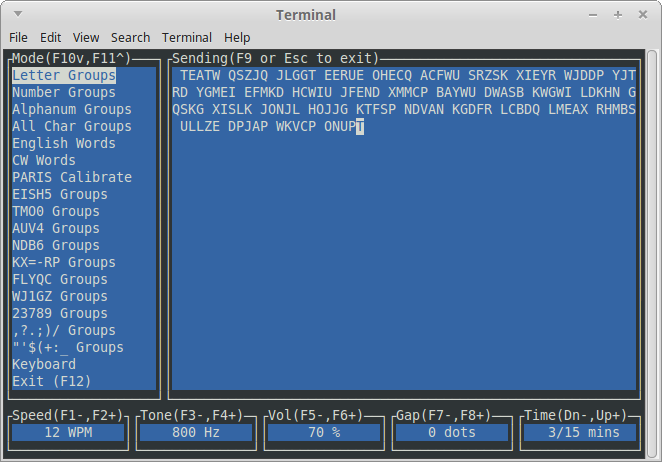 I found qrq by way of a brute search through the Debian archives for anything text-related, and even though I haven’t a clue what to do with qrq, I’ll show it here out of fairness. That’s only partly true — I do have a small idea what to do with qrq. The home page is very helpful, and the program itself has more than enough help just in its startup screen to keep me from shrugging with complete bewilderment. And I imagine if you’re learning or use Morse telegraphy at all, it will be very interesting. It’s also worth highlighting that qrq involves some sound support. Very few console applications take the time to incorporate an audio element, unless they’re specifically intended for audio playback. At this point I should mention that I have no training whatsoever with Morse code aside from learning about it in primary school. Or maybe tinkering with morse. So properly using qrq is well beyond my ability. On the other hand, I do like the interface, even if it is pinned to 80×24. qrq has no flags that I could find, and the man page gives only a little more information than you’ll get from starting the program. 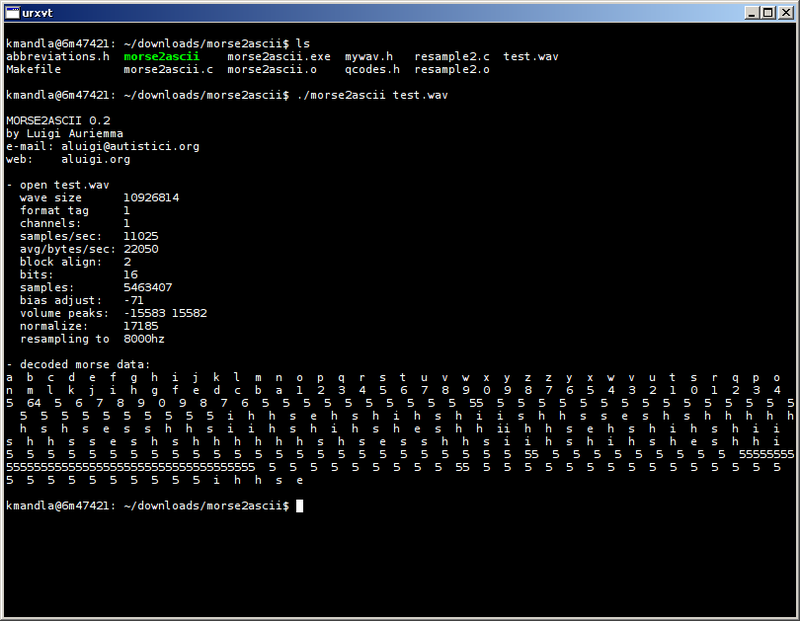 I noticed that qrq is in both Debian and Arch, and the Arch version will pull in alsa-oss when you install it. That might suggest that qrq is a little beyond the most recent developments in Linux audio, but I had no problems with qrq’s sound playback. Other than the fact that I have no clue what those beeps and boops mean. This entry was posted in Linux and tagged code, ham, morse, practice, radio, test, training on 2014/12/12 by K.Mandla. I got a tip about dradio from a frequent contributor who prefers anonymity. If I could coach people on how to make a decent text-based interface, dradio would be a good place to start. Simple arrow keys to select a station, and enter to cue it. Super-big logo. There are playback controls visible in a pop-up help box, and one or two at the command line. Clean and simple. 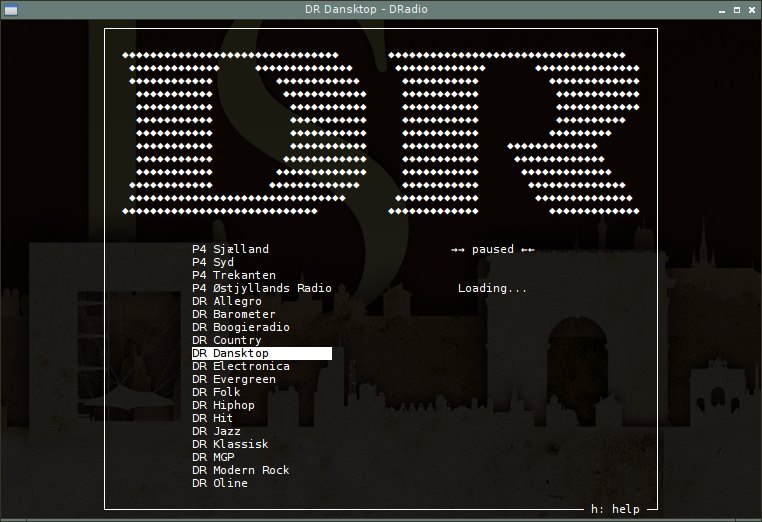 dradio is a frontend to mplayer and is more or less hard-wired to connect only with Danmarks Radio. Which leads me into the only problem I had with dradio: No audio (or for that matter, video) output. Checking the log shows the corresponding address connecting and resolving, but after that … nothing. I don’t fault dradio for that, since force-feeding mplayer with the same addresses that are available from dradio’s configuration files yields an identical amount of nothing. So either the links are wrong, or have moved, or are disallowed on geographic bounds (I am not in Denmark right now). In any case, it appears the fault is not in its stars, and dradio is doing as much as it can to bring music to my ears. It’s a shame that dradio apparently isn’t open to other radio stations though; I suppose I could try to trick it into opening, for example, a stream from soma.fm (because I’m sure it works) by writing it into the configuration files. But otherwise I think dradio is a one-band man. This entry was posted in Linux and tagged audio, client, music, radio, tv on 2014/10/31 by K.Mandla. My daily adventure with ls vimwiki/ | shuf -n1 has dropped me off in the deep end again, this time with a lovely little application that I know ab-so-lutely nothing about. 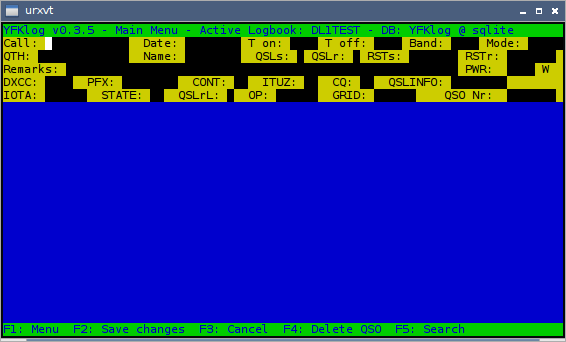 That is yfklog, which is a ham radio log that … I just don’t have any frame of reference for. I know so little about ham radios, I’m embarrassed to say anything about it at all for fear of embarrassing myself on a worldwide scale. I can tell you that it has a nice color scheme that is easy to read. I can tell you it has a menu-driven layout and is very easy to navigate. And I can tell you the one shortcoming that I could see, that it didn’t resize cleanly to terminal dimensions other than the specific size you see above. This entry was posted in Linux and tagged ham, log, radio on 2014/10/05 by K.Mandla. While I search line-by-line through my list of a thousand programs, I run into a lot of stuff I know nothing about. I enjoy learning things, but it’s a sad fact that sometimes I dismiss things out of hand, just because they’re so far removed from my frame of reference. What does all that mean? I don’t know! But it looks cool! I’m being facetious. I have a very primitive idea what ham radio is, and I know there’s a lot of stuff in Debian (and other distros) aimed at radio operators. Why? I couldn’t tell you. 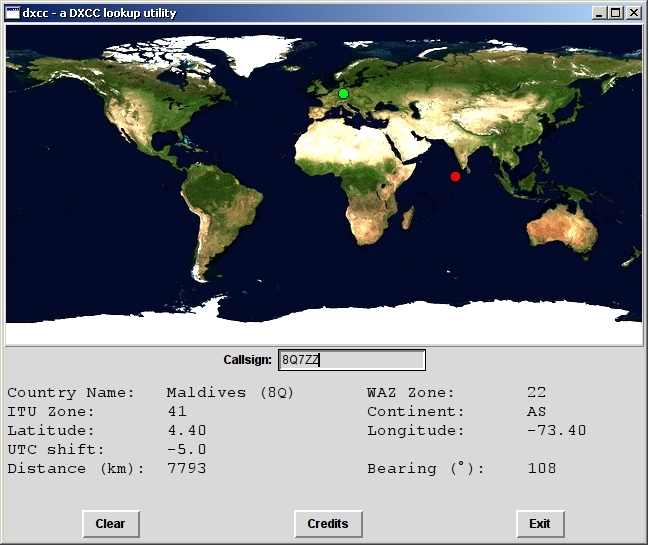 What does dxcc do? I don’t really know. Should you bother installing it? I haven’t a clue! But this is kind of cool too! 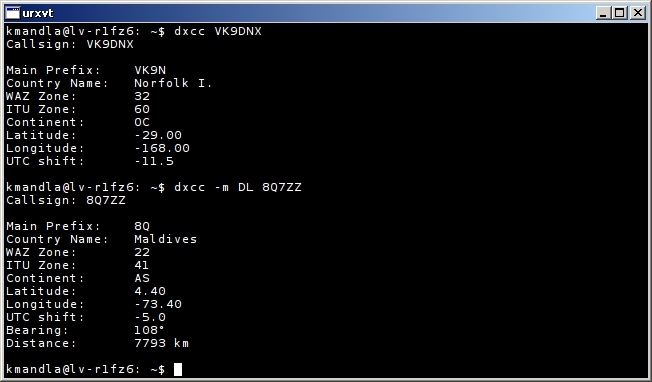 This entry was posted in Linux and tagged callsign, dictionary, information, radio, reference on 2013/10/12 by K.Mandla.